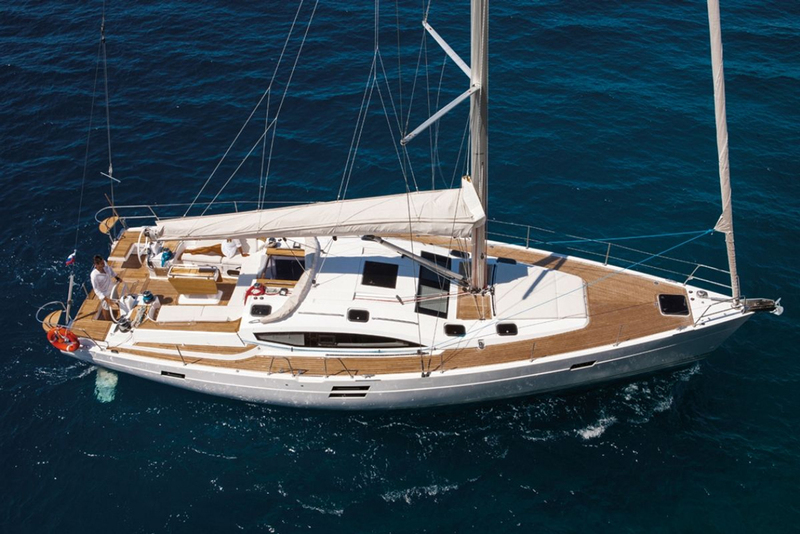 The largest Elan deck salon model yacht, the Impression 50, offers space, comfort and some spirited sailing in a breeze. The Slovenian Elan yard has been building boats for nearly seven decades. 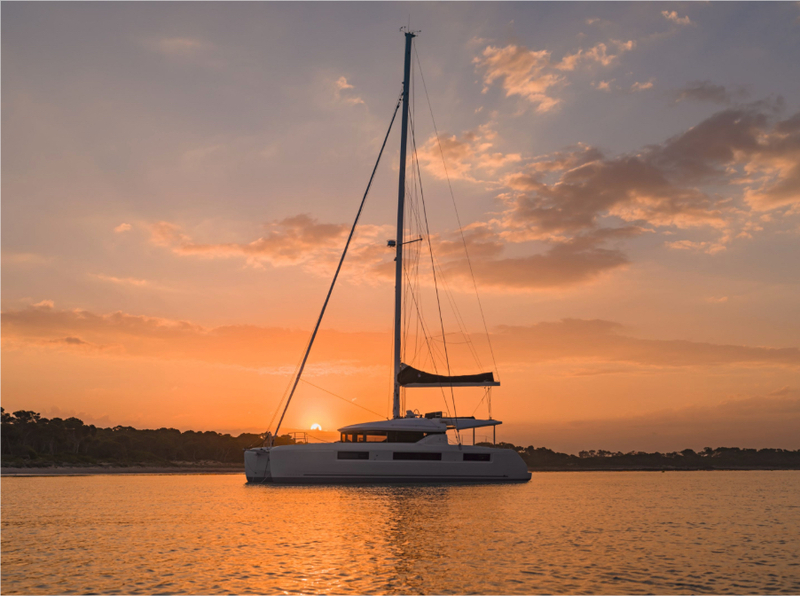 At first they were small no-frills fishing boats and dinghies, but today the company offers three distinctive lines of sailboats, including the luxurious Impression deck salon yachts. The first model of the Impression line was introduced back in 2004 and these Rob Humphreys designs have been a success story for Elan. Today, the Elan 50 tops this line-up. In addition to the two generous staterooms with en-suite heads and showers, there was a bunk cabin for kids or guests. Up forward there is a huge anchor locker, which also could be used as access point for a skipper's cabin. A teak deck with dark and flush-mounted skylights added a nice visual touch. And of course Elan didn't skimp on comfort options, like the large fold-down swim platform on the stern. Or the cockpit fridge that pulls out from underneath the seats to port. Or the wine rack and the electric stove vent in the forward galley that is built in athwartships to save space in a saloon furnished with bright veneer and dark flooring. Under sail, the boat showed how well 14.5 tons of displacement can move through the water, managing a touch better than seven knots close hauled and 8.5 knots at 90 degrees apparent wind angle in 18 knots of true wind. 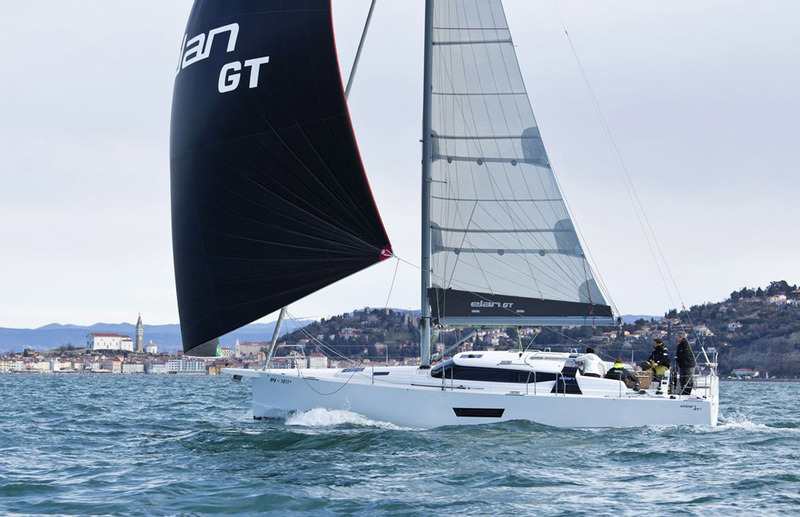 Like on the Elan GT, the twin rudders are a big asset for keeping the boat under control when the breeze is up. But what really mattered in the cruising context was that the Impression 50 was easy to operate by a crew of two. A self-tacking jib, roller furling main, nicely organized trim lines and halyards and power winches kept things simple. 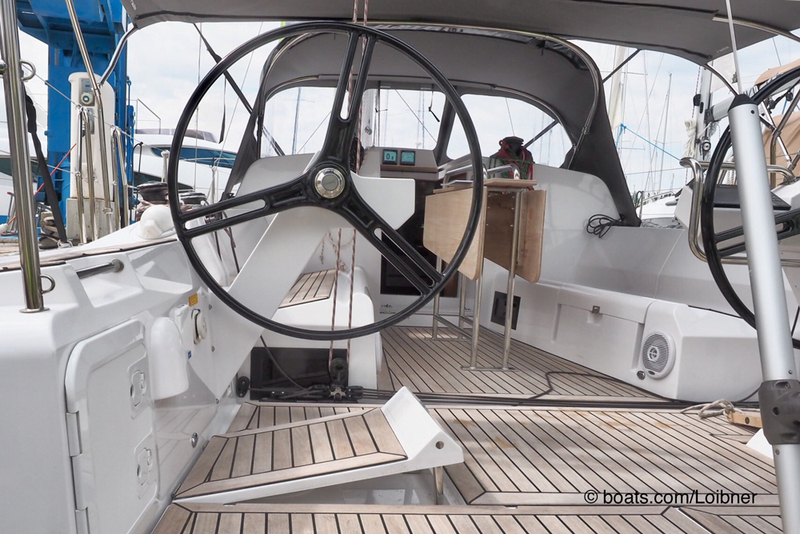 However, the full-sized Bimini, a great source of protection against sun and rain, lacked the windows on top to check the sail trim from the helm. Elan is aware of it and promised to add this inexpensive, but useful feature. The Elan 50 is rigged for a couple to sail her competently. 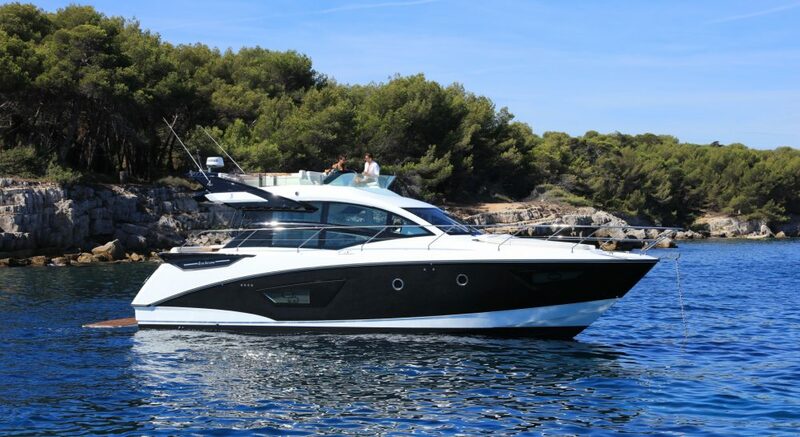 Powered by a Volvo Penta 75 HP diesel engine and a Saildrive, the Impression 50 got up to approximately 8.3 knots of top speed at 2,800 RPM and cruised at 6.6 knots at 2000 RPM. These numbers promise efficient travel under engine, which is, let's face it, what cruising boats are destined to do when it's too light, too rough or when the crew simply doesn't feel like yanking out the sails. 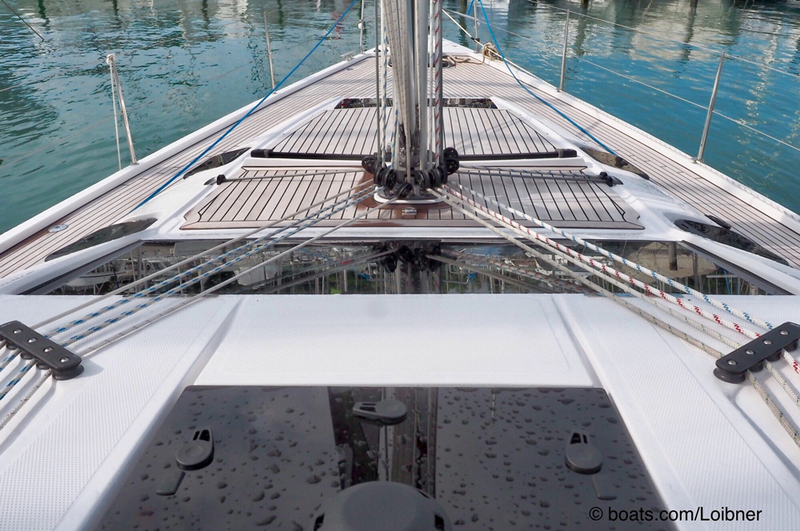 During our test of the Elan 50, it became evident why this line is such a success: there is plenty of space both on deck and below. 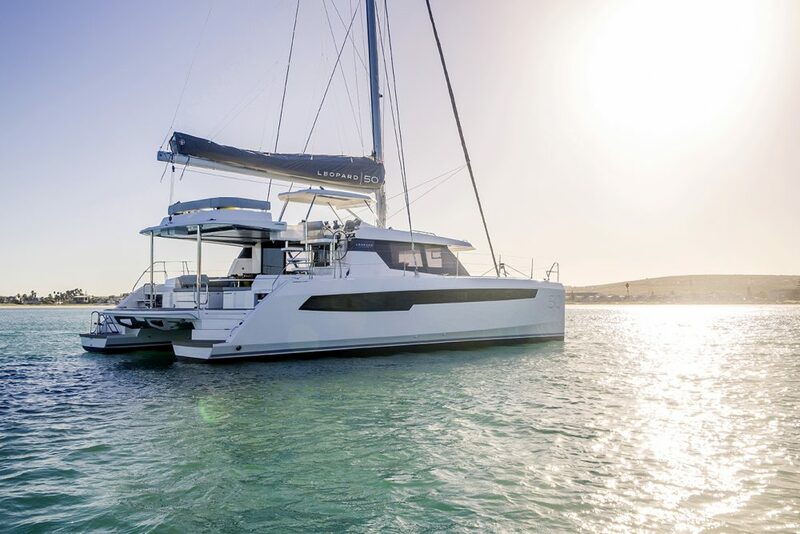 The Elan Impression 50 might not be the latest design on the market, but for more than a decade now it has proven how well the concept of the deck salon resonates with customers who see sailing a as convivial and relaxing endeavor. If you like this style of boat but want it in a smaller package, there are three other Impression models of 35, 40 and 45 feet to choose from—read our review of the Elan Impression 394. 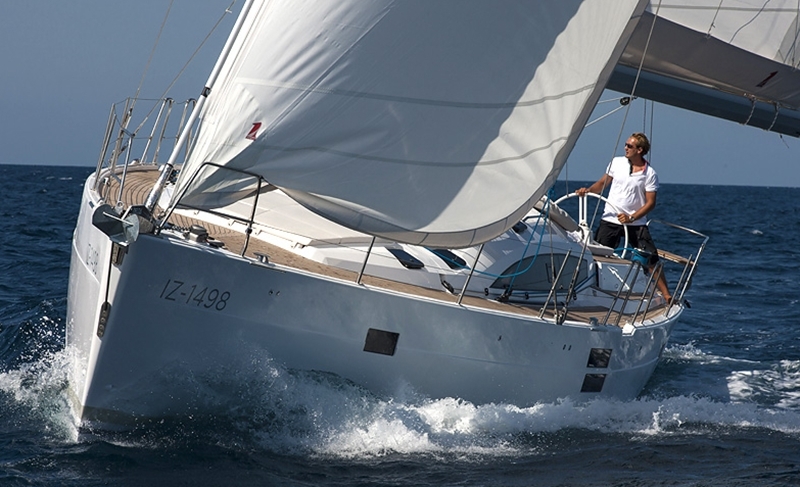 Other Choices: The Beneteau Sense 51 is another sailboat that fits a lot of boat into the LOA. 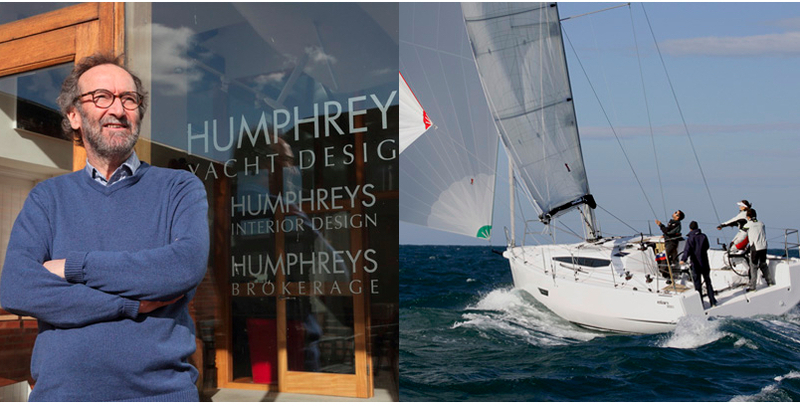 The Hanse 505 might also be of interest, and/or the Grand Soleil 50. For more information, visit Elan. See Elan Impression 50 listings. Sail area (main/genoa) 602/645 sq. ft.